That’s a pretty long title, though it is a literal description of what I’ll be talking about. Perhaps what I really should’ve called this post is: FEAR NOT THE POETRY. My role as self-appointed poetry missionary to the masses sometimes involves me convincing my more prose-lovin’ professor friends that teaching poems can be done well even if you’re not a form-head, techniquey poet walking around speaking in meter and rhyme. Yes, even if you don’t know a ghazal from a clerihew (do these not sound like the names of birds, cocktails, or perhaps delicious desserts? ), you too can teach poems in class—and not just a poem here and there. And you can have fun doing it! Here are some ideas for how to make it happen. Try teaching a collection of poetry. When you teach from an anthology, yes, you can hit a bunch of poets (ow; poor poets) and move on. It’s great for breadth. But I find that students are more invested—whether I’m teaching poems in American lit classes, creative writing classes, or in my college’s freshman discussion and writing course—in reading books of poems than they are in reading poems in anthologies. When you teach a collection of poems, you know that the poet herself chose and ordered the poems that are included. You know that the selection and the order matter for the meaning of the book. You can read the book from start to finish, then, looking for themes, recurring images, and repeated stylistic choices. These are resonances that reveal themselves over the course of a collection but that will not necessarily surface within an anthology. Spend one day with one Natasha Trethewey poem; students will be intrigued and might even like it. Spend two weeks reading her 2007 Pulitzer Prize-winning collection Native Guard (which I have been doing with the aforementioned freshman discussion and writing course since school began for us two weeks ago), and you’ll have students getting incredibly invested in talking about race, grief, memory, identity, place, and all of the other themes that present themselves in this book. But wait, I hear you saying. I don’t remember how iambic pentameter goes and line breaks kind of freak me out. 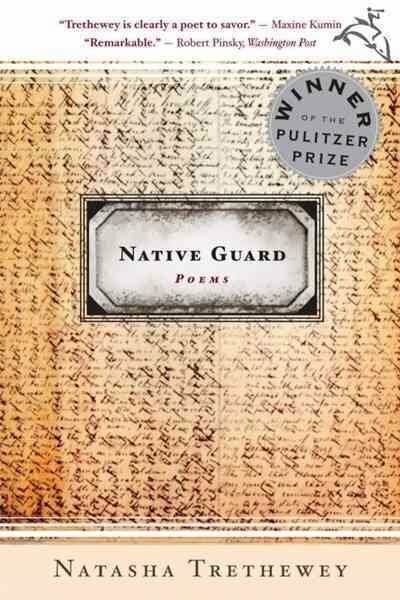 How can I teach a collection of poems like Native Guard? In the remainder of this blog post (and the next couple that follow), I will give you some ideas that you can apply to teaching any poetry collection, old or new. No poetic expertise necessary. I’ll use Native Guard as my test case because it’s accessible, powerful, and beautiful: an important and approachable book that I think everyone should read. More importantly, I have taught Native Guard 7 or 8 times in all kinds of classes (in addition to the aforementioned course, I’ve taught the book in an American war poetry class, several intro to poetry workshops, an advanced poetry workshop, and an intro course on literary analysis), and students agree: they love this book. The methods I’ll outline below are, I think, approachable for any teacher (even if you don’t feel that comfortable with poems) and any time period (I follow this method no matter what century of American lit I’m teaching). Step 1: Look for patterns. That first class, I go big-picture. I ask students what an image is. This is a poetic term, but it’s a commonsense one. Someone will say, “A picture.” We clarify that images are word-pictures that poets create. From there, I ask students, “Without even opening Native Guard, what images do you remember from this book?” We brainstorm a big list on the board. Students will immediately think of things like cemeteries, rivers, crosses, cotton, mothers, roads, diaries, letters, and photographs—all major images in this collection. But there’s much more, so I make this brainstorm last for 10-15 minutes, because they will remember more as they sit there in the wonderfully awkward silence. Then I switch to themes (knowing that I will also need to explain the difference between an image and a theme), in a different marker color at the dry-erase board. Students will offer up themes like memory, race, identity, death, and history. Then I choose still another marker color and ask students to tell me anything they remember at all about the style of the poems. They don’t need to know poetic terminology to do this, and neither do you. They will think of things like rhyme and repetition, and they might even think of things like poem shape or line lengths or if the poem is made up of all questions or if it’s addressed to a “you” or if it’s from the point of view of someone other than the poet. That’s plenty. I tell them to take a picture of the board with their phones and to keep all of these things in mind when they read. In our freshman discussion and writing class, which also aims to teach students good reading habits, I actually have students choose one of the images from our brainstorming session and track it through the book, keeping a list of its appearances that they can later use when they develop a paper on Native Guard. This could work well in an introductory literature course, too, I think. As students look at the poems more closely on subsequent days of class, I want them to be on the lookout for these patterns. Each day I spend on Native Guard, I make sure to highlight at least one of these images, themes, and stylistic choices. By the last day of class, we should be able to talk about why these patterns matter both in individual poems and in the book as a whole. See? That wasn’t so bad, and it didn’t even require any shiny technology. Step 2 involves taking a closer look at things we might overlook: titles, epigraphs, and the order of poems and sections in the book. We’ll talk about that next time.